This is a very special post (and therefore long and full of pics)! The reason this post is so special is because it is in honor of my uncle Alfredo, who was born and raised in Italy. Tio Alfredo, like we used to call him, was married to my dad’s sister, Tia Luiza. And he left us for a better world in 2000, due to lung cancer. It was Christmas Day when we got that dreaded call and he was the first person I have ever lost! But you can put away your tissues, because this post is not supposed to be sad. Oh no, he would hate that! There was no sadness around my Tio, who had the power to turn any upsetting situation into a good laugh. Either making fun of his own (Italian) accent or making sure we stuffed our faces with a lot of food and wine, he always brightened the room. At least that is how I remember him! I’m not condoning childhood drinking, but me and my brother turned out just fine, even though we drank tablespoons of wine at an early age. ?? I will forever associate Italian food to my uncle’s warm personality. We would spend hours at a plentiful table, eating some of the most amazing food I have ever tasted. 5 course meals, always! You would never leave Tio Alfredo’s house hungry. That would be heresy! Every Christmas, we would split our time between my mom’s family and my dad’s family. Christmas Eve with one and Christmas Day with the other. And then, the following year, we would reverse the order, so it was fair to everyone (and to keep our grandmas from complaining too much!). Since Christmas Eve is the big Christmas celebration down in Brazil, we would go to whatever household we were going on Christmas Day expecting leftovers. However, if that happened to be my Tio Alfredo’s house, no leftovers were served. A whole new (5-course) meal was prepared, including their traditional and famous Lasagna Bolognese. I don’t know why, but I grew up thinking that my aunt’s Lasagna Bolognese was a secret recipe that she would never share with anyone. When I finally gathered the courage to ask her for the recipe, she gladly sent me her notes. In Italian! ? Apart from the fact that I had Italian classes during middle school, my Italian is really REALLY basic. So I had to ask my mom – who didn’t go to an Italian school, but is an opera singer, so speaks fairly good Italian – to translate some of it. She translated the ingredients list and I took it from there, tweaking the recipe to match ingredients I could find here in NY and to make it extra cheesy and saucy, because that’s how I like it! I must warn you, if you’re American, this Lasagna will taste nothing like the lasagna you are used to eating in Italian-American restaurants. It is oh-so-much-better! Do not skip making your own ragu bolognese sauce! Store-bought meat sauce is not acceptable. My Tio would be very disappointed at you! But really, what makes this Lasagna incredible is the slow simmered homemade bolognese sauce. Cook it for at least one hour – better if it’s 3! – to develop a complex flavor and proper thickness. But don’t worry! If you are serving this for Christmas, you don’t have to wake up at 4am to make bolognese sauce. Just make the sauce ahead. It will keep in the fridge for a couple of days or in the freezer for up to 3 months. You probably know Colavita for their amazing Extra Virgin Olive Oil. However, what you probably don’t know is that this family-owned company is recognized as the #1 Italian brand in the United States and has earned awards from renowned cooking publications such as Fine Cooking and Cook’s Illustrated. Colavita® authentic Italian specialty products, including durum wheat semolina pasta, a full selection of balsamic and wine vinegars, traditional and organic pasta sauces, and olive-canola blended oils, are the ingredients of choice for chefs in home, restaurant, and professional kitchens. Colavita also exclusively imports and distributes Perugina products (who are all made in Perugia, Italy) to the U.S.
Perugina has a soft spot in my heart. Tio Alfredo used to bring us Baci chocolates every time he came back from his Italy vacations (along with a whole leg of prosciutto, that he somehow always managed to smuggle through customs! lol). Oh how I loved opening those little silver wrapped chocolates and reading the beautiful messages that came inside them, reflecting sentiments of love, affection and friendship. Baci (which means “kisses”) is, of course, Perugina’s most famous confection. Silky dark chocolate envelopes a heart of gianduia (a luscious blend of chocolate and hazelnut cream) dotted with more chopped hazelnuts and gloriously crowned with a whole hazelnut. They are perfect as an ingredient in recipes, as a daily indulgence or as a gift for a loved one. To find out more about the Baci love story, Perugina’s history and the full line of Perugina confections, visit www.Peruginausa.com and connect on Facebook and Twitter at www.facebook.com/peruginabaci and @peruginabaci. When Colavita sent me the Baci chocolate in the mail, it was almost as if I was getting them from my Tio. My heart fluttered and I felt his happy spirit in the room! And for that I will be forever grateful to Colavita and Perugina! So I decided to use the chocolates to create a decadent dessert that can be served at any holiday occasion, or just because. After all, life is short and we should always treat our loved ones to something delicious! Each bite of this tart is like a kiss. A delicious hazelnut crust holds the chocolate ganache (made with Perugina bittersweet chocolate) and chopped Baci chocolates are then sprinkled all over the surface. Tim went crazy over this chocolate tart! He doesn’t really have a sweet tooth but this time I had to fight him for the last piece. There was nothing left to bring to my coworkers, like I usually do with desserts! But that’s okay, because I already plan on making this again for Christmas. I know my family will go nuts over this tart and it will be good to celebrate Tio Alfredo’s life once more. I seriously cannot wait for the Christmas feast my family puts together every year. And, if we happen to spend Christmas Day with my Aunt Luiza, I hope she makes her famous lasagna! In a large heavy bottomed pot, heat the olive oil and the butter, over medium heat. Add the onion and sauté until translucent. Then, add the celery, carrot and garlic and cook for about 2 minutes, until softened. Add the ground pancetta, the ground beef and the ground pork along and season with salt and pepper. Cook, breaking the meat with a wooden spoon, until browned. Add the white wine and let it simmer until bubbled away completely. Add the crushed tomatoes and the heavy cream along with the cinnamon and the grated nutmeg. When the tomatoes begin to bubble, lower the heat, cover and simmer for 3 hours, stirring occasionally. If the sauce dries out too much, add a splash of water or heavy cream as needed. Reserve. In a medium saucepan, over medium low heat, heat the butter until melted. Add the flour and whisk until smooth and all the raw flour smell is gone and the flour is golden, about 5 minutes. Add the milk slowly, whisking constantly, until you have a smooth sauce. Remove from heat and add the parmesan cheese and the heavy cream. Stir until the parmesan is melted and incorporated into the sauce. Taste for seasoning and season with salt, pepper and freshly grated nutmeg. To assemble the lasagna, coat a 13X9’ lasagna dish with butter. Spread a layer of béchamel sauce and one layer of bolognese sauce on the bottom. Top with a layer of lasagna noodles, followed by a layer of béchamel sauce, a layer of bolognese sauce, one layer of mozzarella cheese and one layer of grated parmesan cheese. Repeat the process until you’ve used all the lasagna noodles. On top of the final layer of noodles should go the remaining bolognese sauce and the remaining cheese. Place the lasagna on a baking sheet to catch any drips. Cover with foil and bake for 30 minutes or until the top begins to get lightly browned. Remove the foil and bake for another 15 minutes or until the lasagna is bubbly and the top is browned. Sprinkle with a handful of chopped parsley and serve. In a food processor, pulse the hazelnuts and 1 tablespoon of sugar until fine. Transfer the hazelnut flour to the bowl of a standing mixer and add the flour and the remaining 3 tablespoons of sugar, mixing until combined. Add the cold butter and, using your fingers, work the butter into the flour until it resembles coarse sand. Bring the bowl to the standing mixer, fitted with the paddle. Add the egg and the vanilla extract and mix on low until a soft dough forms. Do not over mix. Transfer the dough to a sheet of plastic wrap and flatten into a disk. Refrigerate for 1 hour. After 1 hour, preheat oven to 350 F.
Prepare a 9-inch tart pan (with removable bottom) by spraying with cooking spray. Reserve. Place the disk of dough between two sheets of parchment paper and roll to 12-inch wide. Carefully, place the pastry into the tart pan, folding the excess inside and pressing it into all corners. If the dough breaks, do not freak out! Just cut some excess dough and use it to patch any tears. Place the tart shell in the fridge for 10 minutes or in the freezer for 5 minutes. Bake for 15 to 20 minutes or until the edges of the crust are starting to turn golden. Remove the pie weighs and the parchment paper and return the crust to the oven for another 10 to 15 minutes or until the edges have browned and the bottom is golden. Let it cool completely before pouring the filling into the crust. To make the filling, place the chopped chocolate in a bowl. In a saucepan, bring the heavy cream to a simmer. Do not boil! Pour the hot cream over the chocolate and let it sit for a minute. Then, whisk until smooth and glossy. Let it cool slightly before pouring into the crust. Once the ganache is cool, pour into the tart shell. Finish by scattering the chopped Baci on top. Refrigerate for 1 hour or until firm and serve! P.S. 2 For a chance to win a large basket of Colavita’s and Perugina’s award winning oils, delectable chocolates and Italian ingredients, enter the sweepstakes below! Good luck! Such a great post and a lovely story about your uncle! Love both dishes, perfect for the holidays! Pinning! This is such a lovely post Olivia, loved reading about your Uncle. 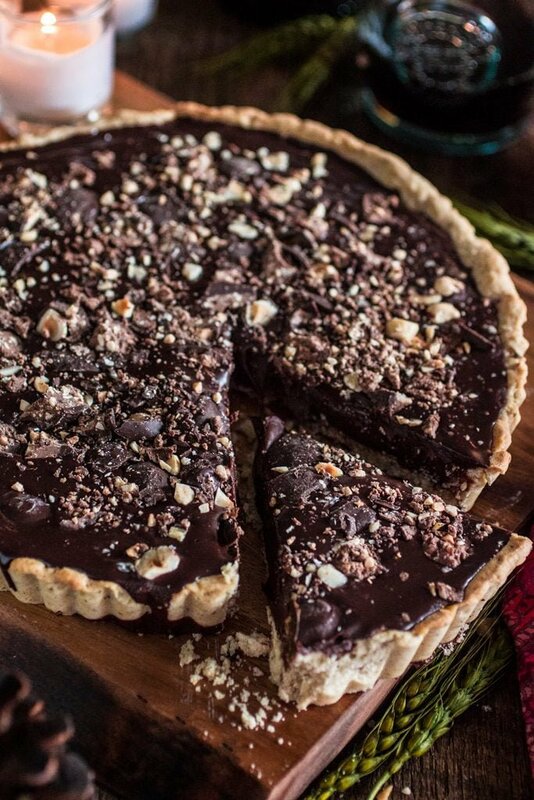 Seems like you shared an amazing bond with him :) I love that tart, the hazelnut crust sounds amazing! Your uncle reminds me of my childhood and uncles who shared some ale with me for the same reason! He seems like a nice person to look up at! Sorry to hear you lossed him to soon! Uncles are the best aren’t they? They’re like our second dad…. but more fun. :p The lasagna and tart looks amazing. Will try making them soon. Yum! Yes, they are the best indeed! :) Let me know what you think when you make them. Can I come over for dinner?? That Lasagna is TO DIE FOR!! and then that tart too??? I am pinning this and setting a reminder to make this! Both of these recipes look amazing! I am usually not a huge lasagna fan but yours looks AWESOME! Oh, Annie! You’ve made my day! :) Thanks so much for your kind words. Means a lot coming from an Italian girl! This looks like a great meal! Your photography is beautiful! That looks like a perfect holiday table. Both the recipes looks really easy to make. What a lovely post – just really, really sweet. Thank you for sharing this! Can I come over for dinner at your place? Your family sounds amazing, (an opera singing mom, an amazing uncle and aunt…. and the food! Such great family history! I will be making both of these!! I LOVE everything about this post! Gorgeous photos, heartwarming memories, amazing food! Stumbled, pinned etc! This is seriously the most tasty looking lasagna I’ve seen! Yum times 1000! 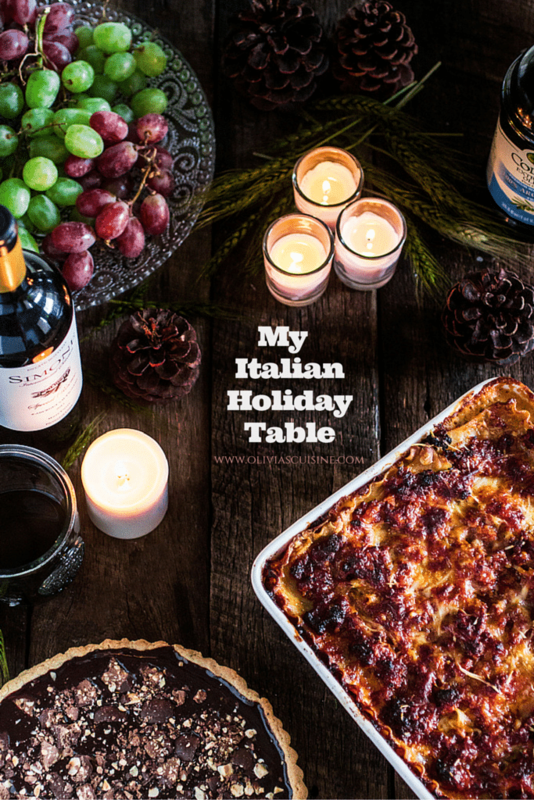 I would love an Italian holiday table — all of it looks crazy delicious! Now I am not sure if I need to make the lasagna or the tart the most? Maybe i need to do as you have done and have them both in the same meal. Hi Jeannine! Yes, you can totally assemble this the day before and keep it in the fridge, ready to bake. Or you could even make it now and freeze it. Just be aware that it will take longer to cook if it’s frozen! :) I hope you make it and enjoy it. Let me know what you think when you do. Happy holidays! 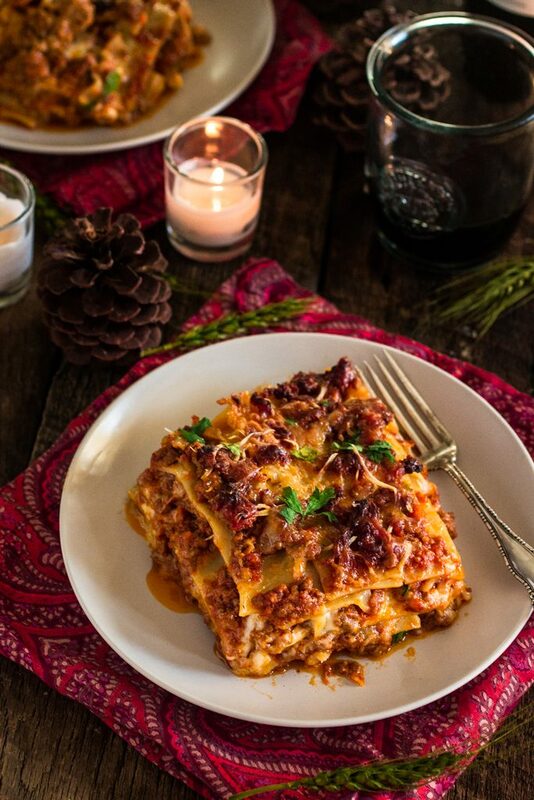 Omg, I made lasagna bolognese for this Colavita campaign too! Love your version and that tart looks to die for! Hello Olivia. No disrespect to Tio Alfredo but I made this with no-boil lasagna noodles. It was my first time using them and believe it or not, I couldn’t tell the difference. If anything they were thinner so I was able to do more layers. Have you ever used them? (I understand if you don’t want to put such a thing in writing.) Thank you again for your wonderful recipes! Beth, I hope my uncle doesn’t read this from heaven, but I use no-boil noodles all the time! lol I also can’t tell the difference and they are very practical! :) I’m glad you enjoyed it. 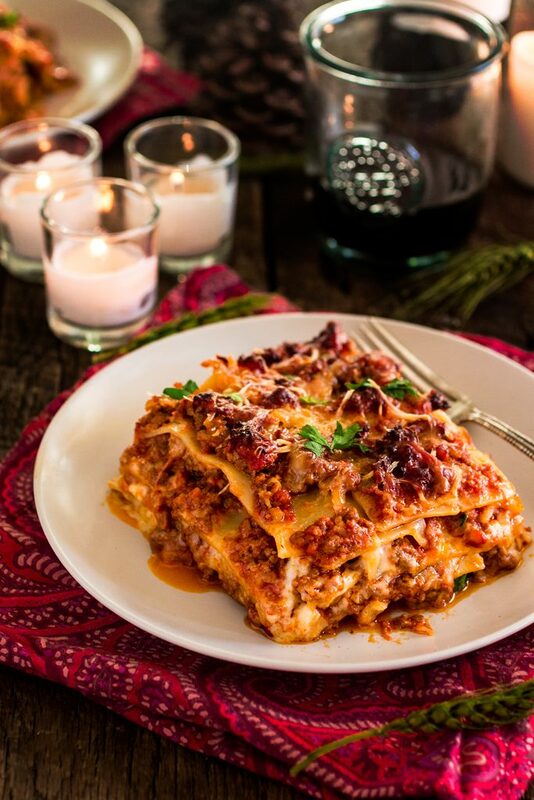 This lasagna is one of my favorite dishes of all times!